Pancho: Cisco, I'm all mixed up in my head. Bonanza Sheriff: [speaking to Cisco] Are you trying to make a fool of me? Pancho: Don't blame us for what nature did. The Cisco Kid: How will you sleep tonight if you're going to take a siesta all day? Pancho: I'll worry about that tonight. Pancho: [after Cisco's horse wakes Pancho] Diablo, you just wait until you take a siesta. I'm gonna' woke you up. Pancho: I never shoot a man in the back if I can see him faces to faces. The Cisco Kid: You're a very stubborn man, Sheriff. Pancho: That's what makes sheriffs, sheriffs. I think. The Cisco Kid: What are you worrying about? Pancho: I'm worried that if my worries are over, I won't have anything to worry about. Pancho: Let's get our horses and went. The Cisco Kid: You just have to learn it the hard way, that every man is your brother. Pancho: I know somebody who not my brother. Pancho: I understand what you say, but I don't know what you mean, Cisco. 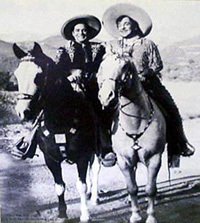 Pancho: [to his horse after it had been stolen] Loco, finding you is like finding a lost long brother-in-law. Pancho: I will keep my eye on him like a peeping Tomcat. Pancho: You think you are going some places? You're not going no places. Pancho: This fellow here will steal the pants right off your back. The Cisco Kid: You think you are going some places? You're not going no places. The Cisco Kid: This fellow here will steal the pants right off your back. Pancho: Oh! That's a different horse of another color. The Cisco Kid: How can you get so mixed up? Pancho: Well, it takes lots of practice. Pancho: How can you get into so much trouble without Pancho? The Cisco Kid: I'm doing pretty well by myself. Sheriff: You're sure you left Mrs. Collins here? Pancho: Sure, we're sure we're sure. Pancho: Cisco, I can't believe what my eyes don't see. How can a bed get up and walk? [first lines] Sheriff: [on horseback with a posse] This is as far as we go, boys. We're not going down in that hole. Too many folks have disappeared down there. I've got a hunch the Cisco Kid and Pancho aren't coming out alive, either. Pancho: What is this, Cisco? Is good men who think we are bad or bad men who think we are good? The Cisco Kid: We'll soon find out, Pancho. Pancho: [after getting the drop on a henchman] Hey, you over there! Take that gun out of your holster - unless you want a little hole in you someplace. Drop it on the ground! Pancho: We've had so much trouble today, so who cares if we have a little bit more. Let's went. Pancho: [after Cisco explains that a Scotsman's kilt is his native costume like he and Pancho wear sombreros] We wear sombreros to keep the sun out of our eyes and he wears a skirt to, well...? Pancho: [upon hearing a bagpipe for the first time] That kind of music sound like you stepping on a cat's tail. Pancho: [after trying to play the bagpipe himself] It's just like catching a little pig and squeezing the squeals out of him. Pancho: I'm surprised sometimes how I surprise myself. Pancho: That's the best plan I never think of. The Cisco Kid: How can you get in so much trouble and so quickly? Pancho: This man say you are a crook. Constable Slate: [after Pancho accidentally hits him with his bolas] Put that thing away. Pancho: I beg your partner. Pancho: [trying to select which photograph of Pancho to submit to marriage-by-mail] How do you like that one? The Cisco Kid: I don't like it. The Cisco Kid: It looks too much like you. Professor: [Pancho has entered a win-a-wife drawing] We're having a special drawing here an hour from now. Here's your number. Ya better come around. Pancho: Don't worry, I will be there. Professor: By the way, which do you prefer - blondes or brunettes? Pancho: Don't make any difference naturally. I like blondes. I don't care how they get that way. The Cisco Kid: Professor Bradley was some kind of a poet. This is a jingle. Pancho: A jingle? No. A jingle is a place where the lions and the tiger live. Sheriff: No. That's a jungle. Pancho: No. Now, you see you don't know nothing. A jungle is a jungler who jungles the ball like that. The Cisco Kid: [watching Pancho mimic a juggler] Hey, Pancho. The Cisco Kid: That's juggling! Pancho: Juggling? Jiggling? Gig? That's when little girls laugh - hee, hee, hee! That's a giggling. 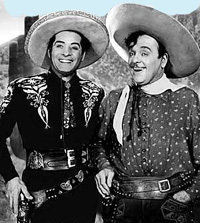 The Cisco Kid: Pancho, that's a giggle. Pancho: Oh, a giggle? That's a rhyme, Cisco. The Cisco Kid: [simultaneously with the Sheriff] That's a jingle, amigo. Pancho: That's what I told you in the first place! Don't you? Hmm? Pancho: [laughing with Cisco] Se?or X put a nice brand on them for the sheriff, huh?. X marks the spot! 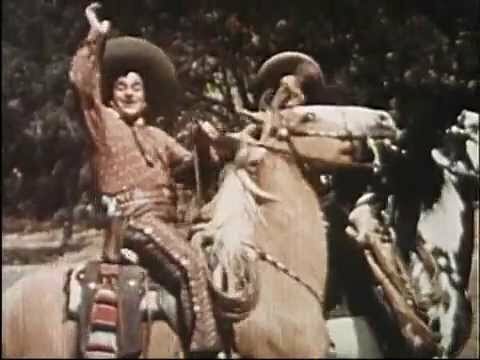 The Cisco Kid: Oh, Pancho! Pancho: Senor, don't talk so much here. Wait and use all those words in the courthouse with the judge. Dorsey Knudsen: Alright, let's go. I won't have any trouble proving my innocence. And for your information, I won't need a jury or a tricky lawyer. Pancho: [acting as bailiff] Are you gonna swore that everything you say in this courthouse is the truth, the whole truth and everything but the truth? Jeff Adams: I'd introduce these men, Ruth, but I don't know who they are, except they've become mighty good friends of mine all of a sudden. The Cisco Kid: [shaking hands] I am The Cisco Kid, and this is my very good friend, Pancho: handsome, brave, and very modest. Pancho: You are pleased to meet me. Pancho: [examining body] Nothing you can do with him, Cisco. He's too dead. The Cisco Kid: Pancho, we don't have actual proof against him. We've got to make him expose himself. Pancho: I will do what you told me, but it's much more easy to expose him to a bullet. The Cisco Kid: Drop those guns. You'll not need them in prison. Pancho: [lecturing Terry after Cisco has given him a well-deserved beating] Remember, mister, when you lose your temper, it's the hardest thing to find. Pancho: Drop that knife! Or Pancho will put your wishbone where you backbone oughta be. The Cisco Kid: See, I told you the bear is tame. Pancho: You know that and I know that, but does the bear know that? Pancho: Bosses in skirts. Maybe our troubles are just beginning. Curt Reynolds: Is he dead? The Cisco Kid: He's as dead as he'll ever be. Sheriff: I'm gonna see to it that the both of you hang! Pancho: Hey, Sheriff, don't say that. Without my neck, I can't swallow frijoles. Pancho: A little trouble here. A little trouble there. You put them altogether and it spells Cisco. Pancho: Talk, Mister or Cisco get mad. And when Cisco get mad, Pancho start breaking heads. Pancho: You sound like a sheriff. Sheriff: I am the Sheriff. Pancho: [looks at the star on the man's chest] Yeah, I see your baggage. Pancho: Let's go before I change his mind. The Cisco Kid: There is something Pancho and I can do. Pancho: Yes, there is something we can do. We could - we - what is it? The Cisco Kid: Investigate, Pancho. Pancho: I don't have a mind to invest in a gate. What good would that do, anyhow? [last lines] Pancho: Cisco, you know - I can read in two languages at the same time with my eyes closed and standing on one foot. The Cisco Kid: [laughing] Oh, Pancho! Pancho: We ride out like Lock-in-the-jars. The Cisco Kid: Oh, Pancho. You mean like Lochinvar. Pancho: We like out like Lock-in-the-jars. [first lines] Jerry: [approaching two men standing outside the bank] I beg your pardon. Could you tell me the time? Jerry: [lowering her voice] Keep your eyes open, Joe. The town marshal just road in. Pancho: A vaquero walking! That's a disgrace. The Cisco Kid: Alright, Pancho, hit the deck. Pancho: What I want to hit the deck for? It didn't hit me, Cisco. Pancho: Cisco, I don't mind doing what I'm doing, but I don't know what I'm doing. The Cisco Kid: And you're just the one who can do it. Pancho: I don't mind doing what I'm doing, but I don't know what I'm doing. [first lines] Pancho: [observing a horse-drawn fire engine galloping down a dusty prairie road] Hey, Cisco! Do you see what I see? A fire engine out here in the middle of nothing-at-all. Pancho: [after opening a doctor's closet and finding a skeleton] Cisco, look, it's somebody with nobody on the outside. Pancho: Never count your chickens before they cross the bridge. Pancho: Now, like always, my pockets is all empty again. Pancho: [after finding an egg from his pet raven in his pocket] Se?or Cortez, he is a mother. Pancho: [amazed by Tim's gymnastic ability] Holy smokin'! Cisco, he's got springs in his pants! Pancho: Hey, Cisco, will you do me a big flavor, Cisco, please? The Cisco Kid: A flavor? You mean a promise, Pancho? Pancho: Yes, Cisco. Don't tell Loco I've been riding this two-wheel horse because he's awful jealous of me, if I ride anything but him. Morgan: [attempting to sell an insurance policy] Do you realize, my friend, that there's more accidents happened in the home than any other place? Pancho: Yeah - but I don't got a home. Morgan: Well, where do you reside? Pancho: Hey, Cisco, this wedding gonna wind up to be a funeral for Pancho, I think. Pancho: [after Morton's henchmen get the drop on him] Hey! Don't do something I'll be sorry for.